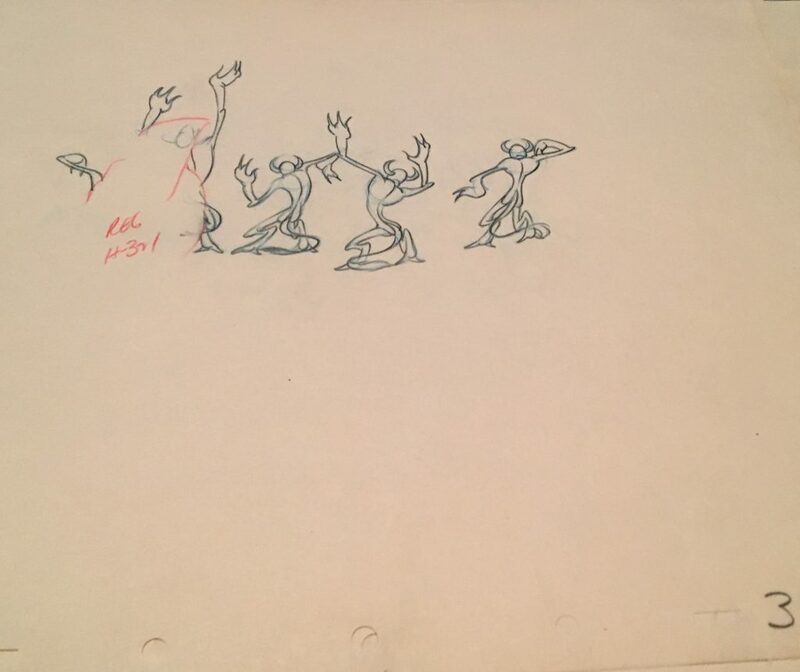 So…to restore or not to restore…and what does a collector need to ask or look for when considering vintage animation art for purchase? How might the art have been altered or restored? 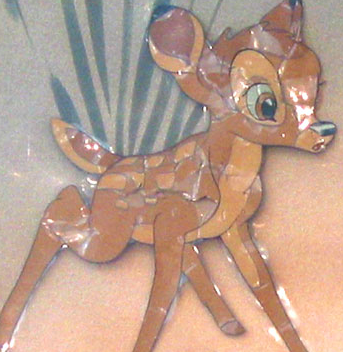 What to do when a cel is damaged you are considering or gets damaged while on your wall or in your collection? 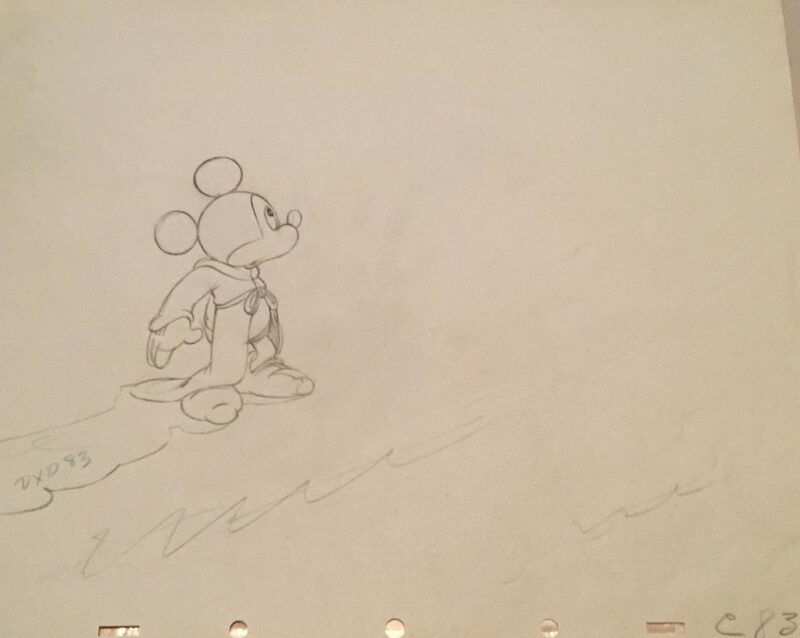 My opinion on this is that it is absolutely fine to restore cels. 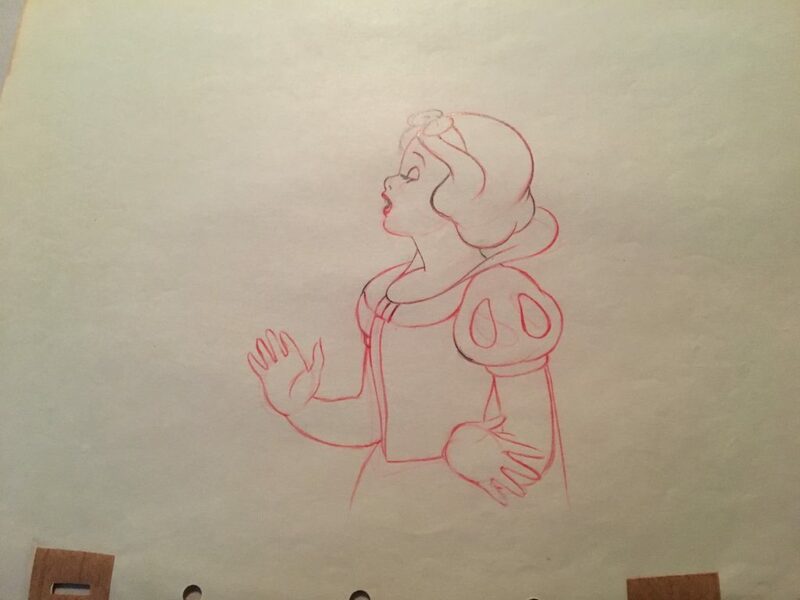 However, the world of animation art needs to set parameters of what is acceptable and it is essential as a part of the “industry” to know BEFORE you buy a cel whether it’s been restored already or not. 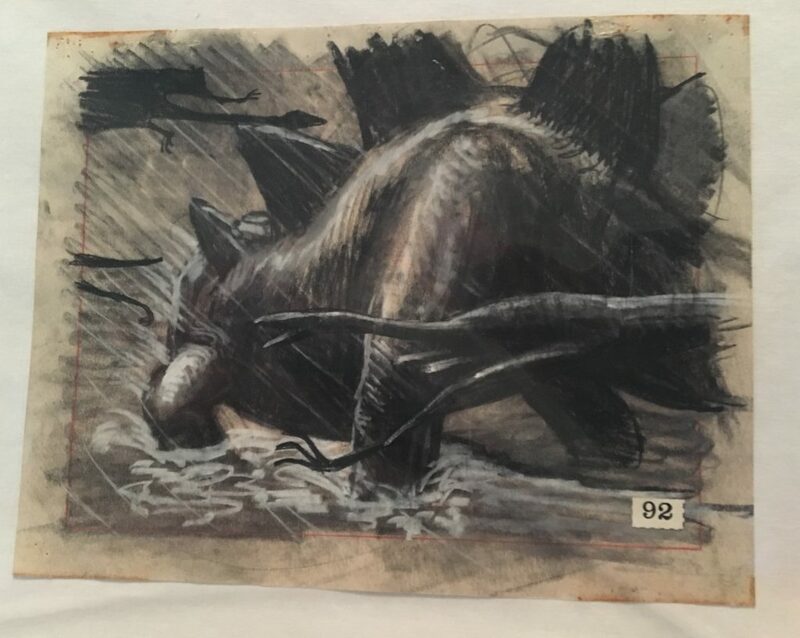 While the collectors I know are perfectly willing to buy art that has been repaired or even needs repairing, there are often cels that are sold from old collections that have little to no paint and are completely repainted. As long as the potential collector is aware of that, no harm done. However, if they are under the impression that the paint is original, that seems disingenuous. Also, ArtInsights often buys art for more money for the very reason that it hasn’t been touched by restorers. There are many dealers and collectors buying art for next to nothing and having that art restored, then selling it for less but without stating the art’s history with restoration. 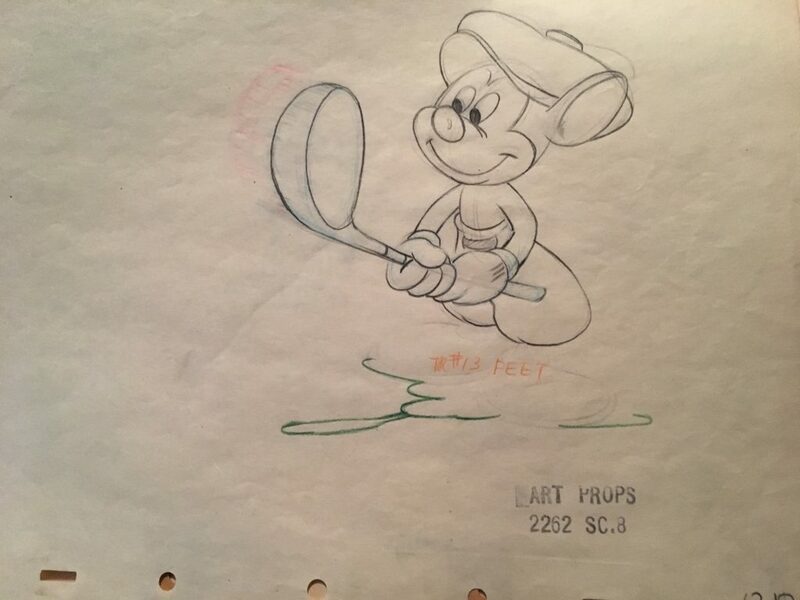 Also, part of “restoration” or “giving the art more eye appeal” may involved adding cels that are not production to a set up that enhances the image. Now this is not referring to putting together cels that come from different sources, that is perfectly fine. 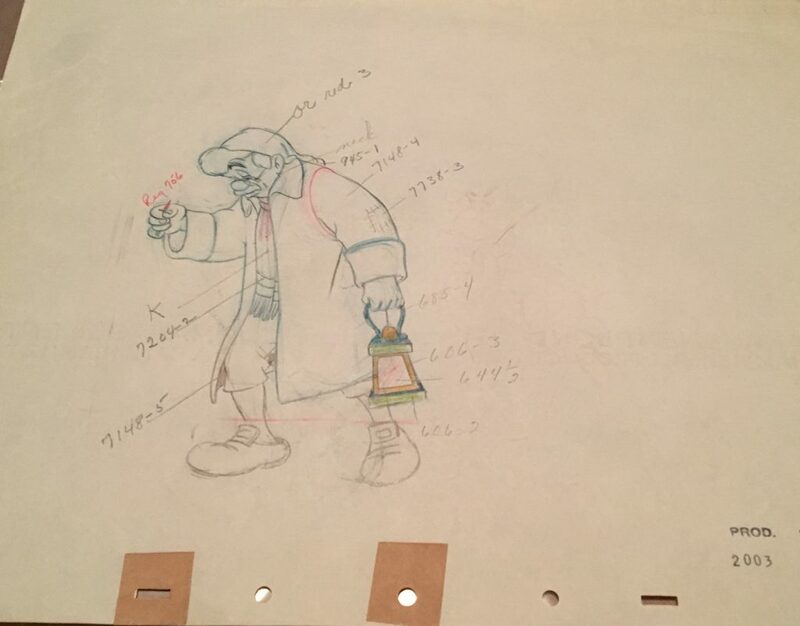 This is referring to opening up eyes that were previously closed…or adding more to a registered cel to complete a cel where the arm, or half a wing, or whatever, is missing… or adding Tramp to Lady, when the cel set up previously only had Lady there, and the Tramp cel has just been manufactured to add “eye appeal”. These are all practices that border on fraud. 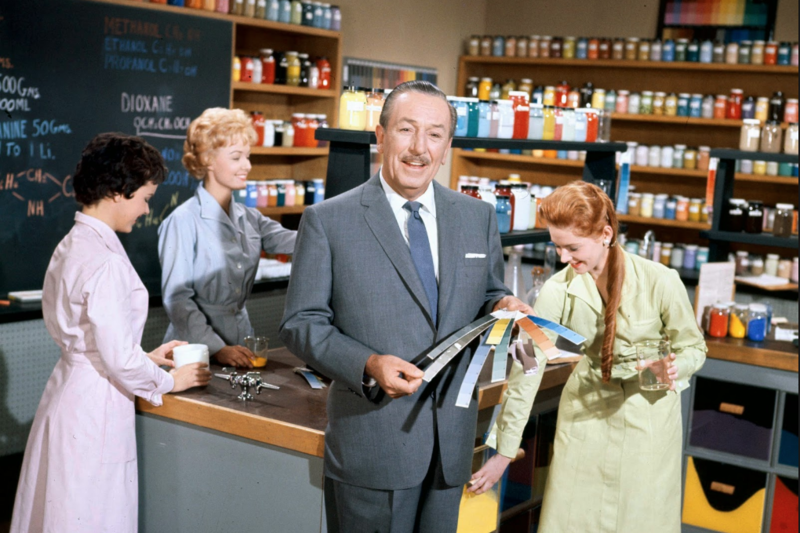 It is part of the reason ArtInsights sells less animation now, because we’d rather just follow our own rules without calling attention to what any other dealer may or may not be doing. As a collector, here are some questions you may want to ask when purchasing art, whether from ArtInsights or from another gallery, dealer, collector, or auction house. 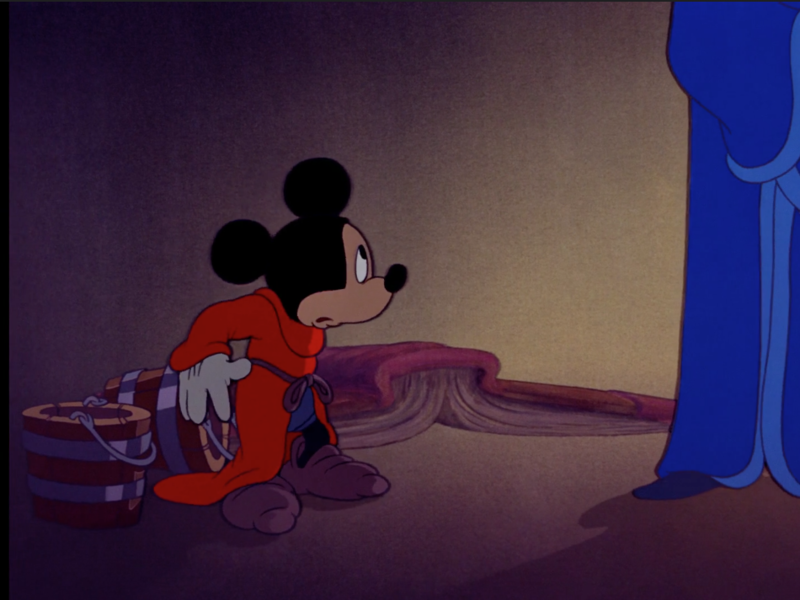 While there is no guarantee anyone will be completely transparent, at least you’ll know you’ve asked the right questions… PLEASE REMEMBER to always watch the movie to find the cel therein. 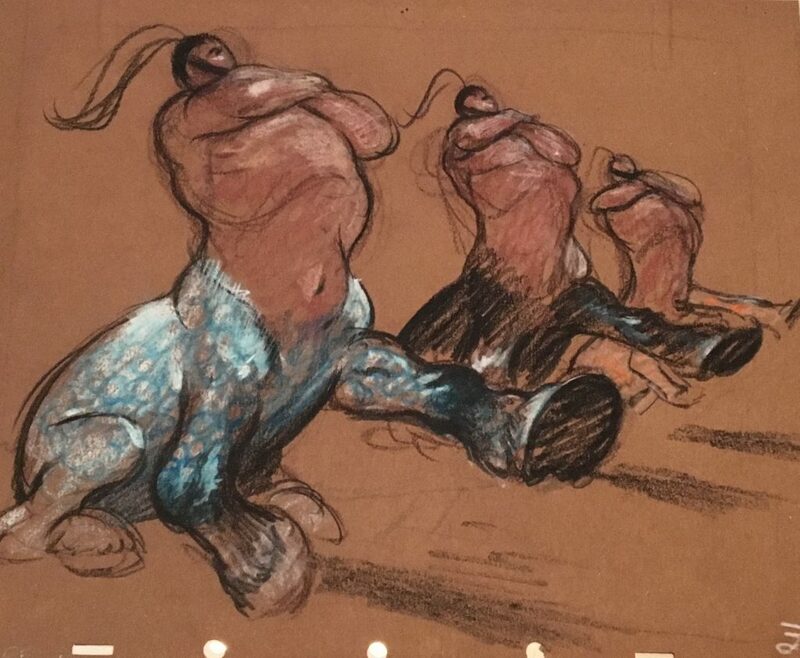 If the gallery or company with whom you are transacting has already done it (which they should have) or knows where in the film the image originates, have them tell show you, and/or reaffirm by watching it yourself. 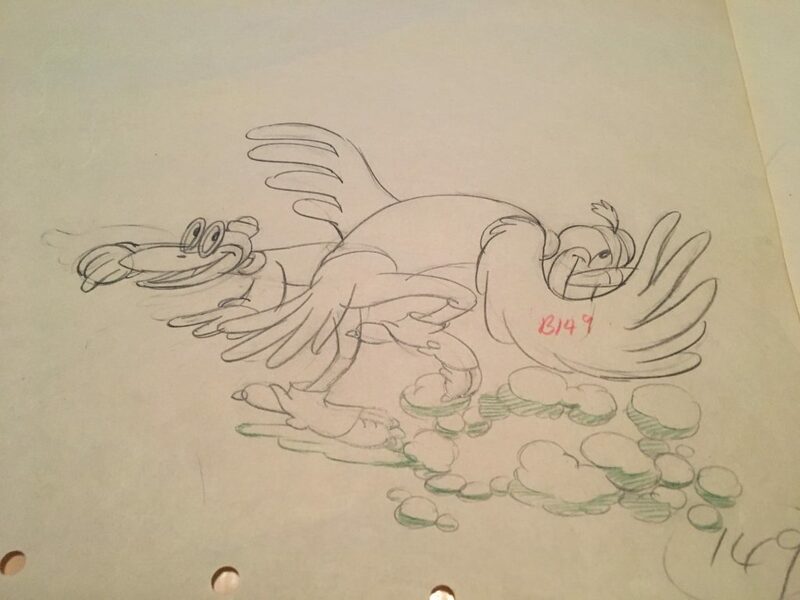 There are certainly cels that come from cut scenes, or edited scenes, or are more concept than finished, but whoever you are working with should know that and tell you so. Has the art been restored in any way? If so, by whom? If that is considered proprietary information, at least ask whether it has been restored in gouache or acrylic paint. 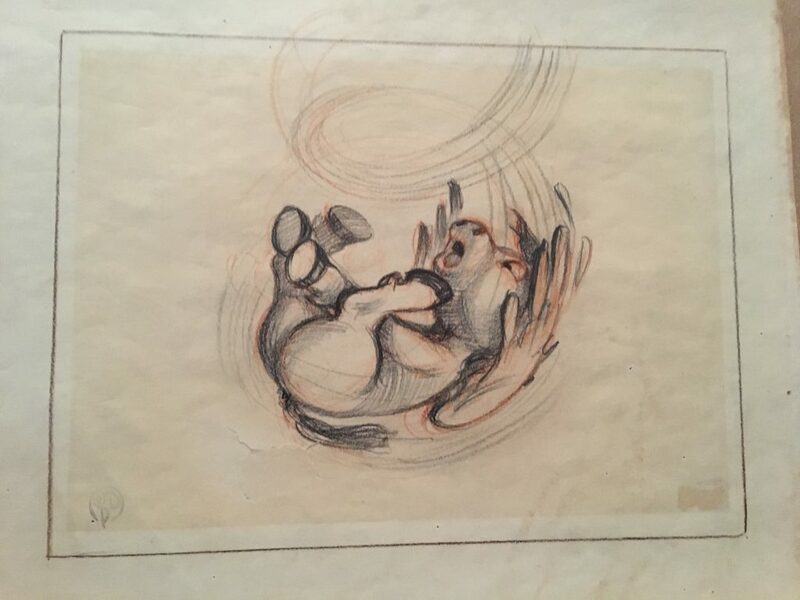 If restored, was there any line work done? 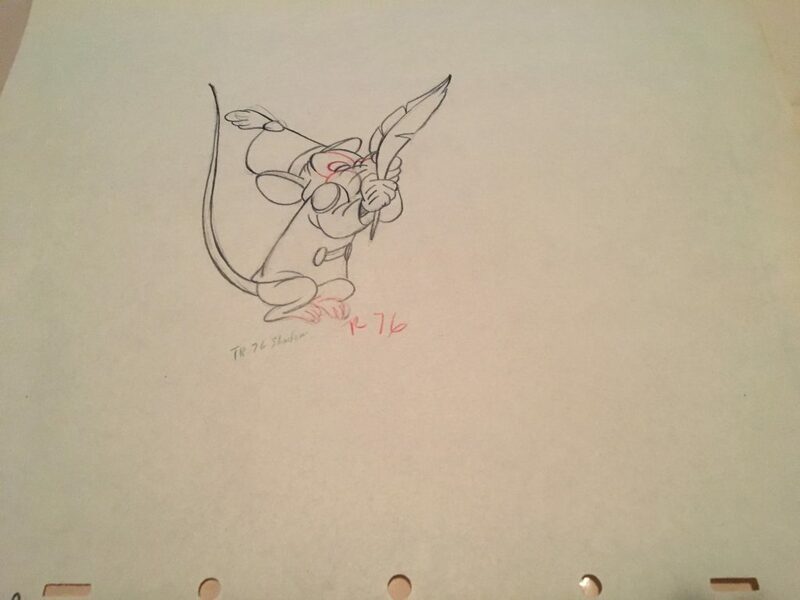 (the ink line is on the surface of the cel and paint is on the back. Even very liberal dealer/collectors believe there should be minimal line work done–i.e. 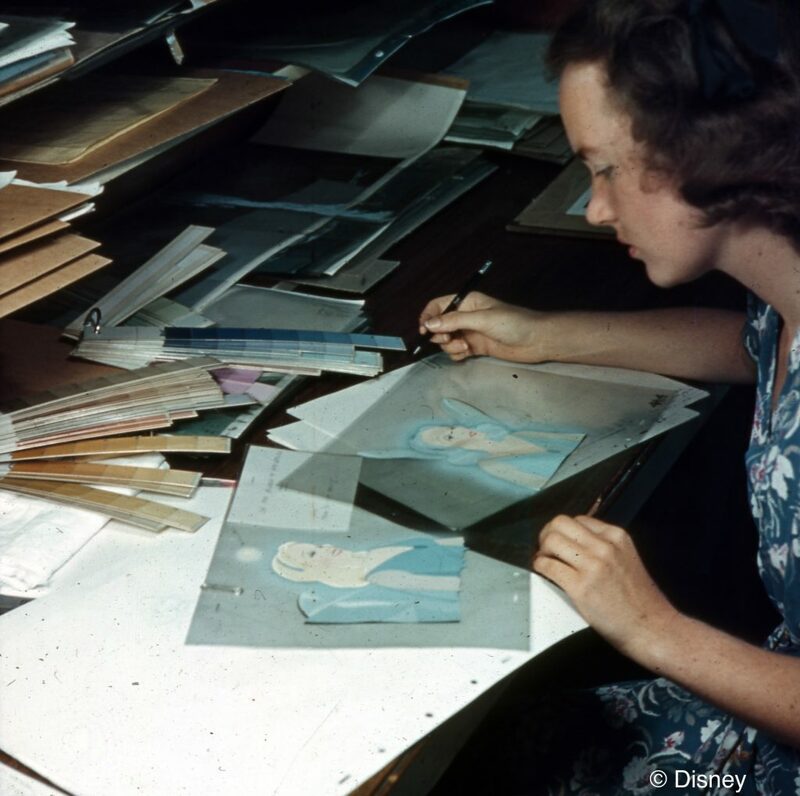 outlines repainted–as part of restoration ….At what point does the art lose all original integrity? 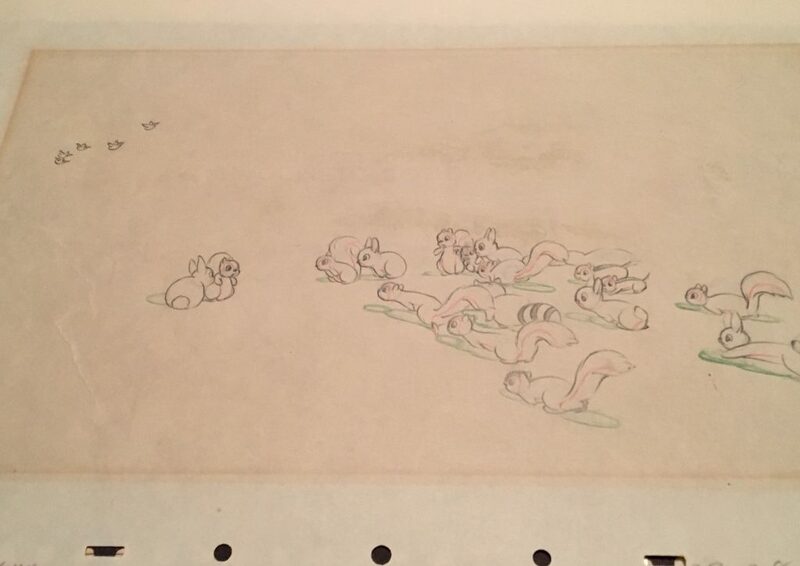 If restored, was the art trimmed and reapplied to another cel? 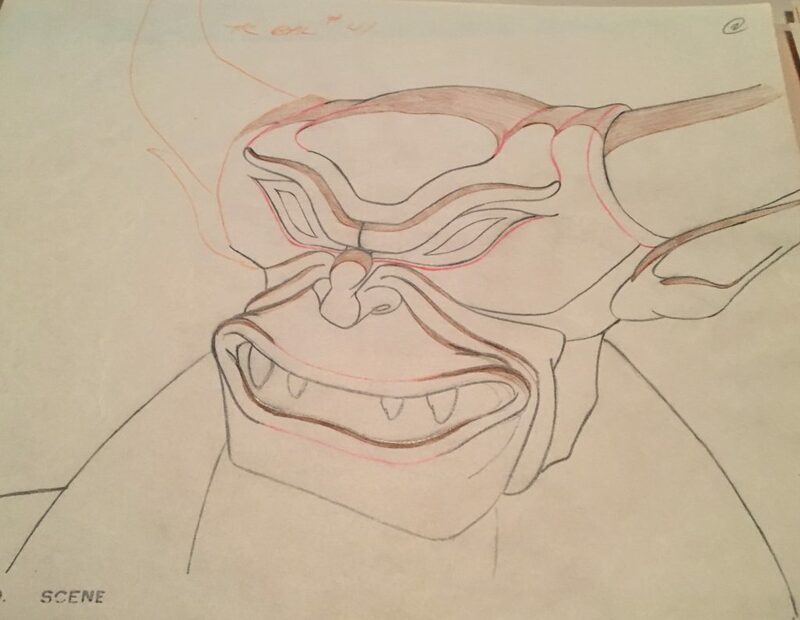 Some believe this effects the value, but this is another argument in the animation art world…because “CEL” refers to the whole piece of plastic, not just the part with the character. 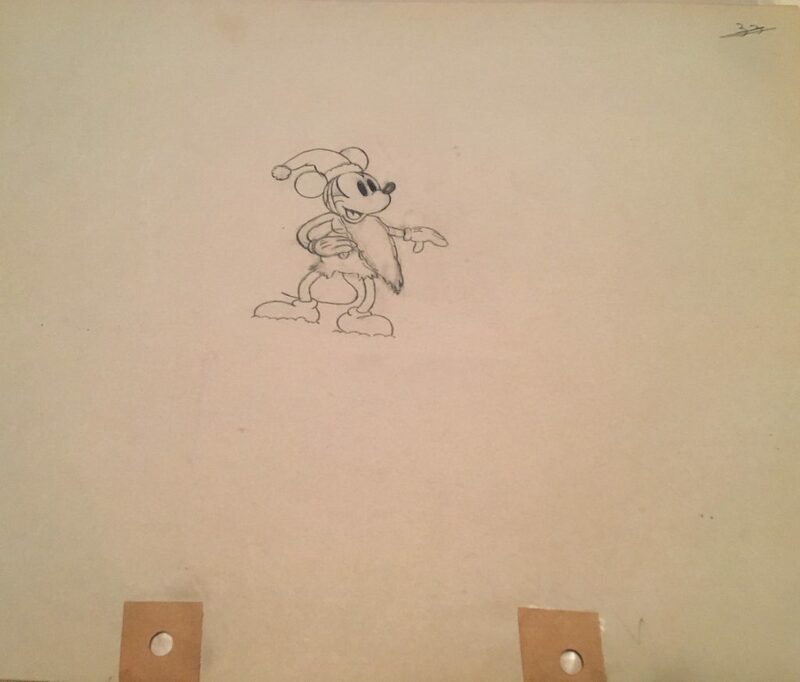 When you buy a cel, you are buying the piece of plastic, not just the image of the character. 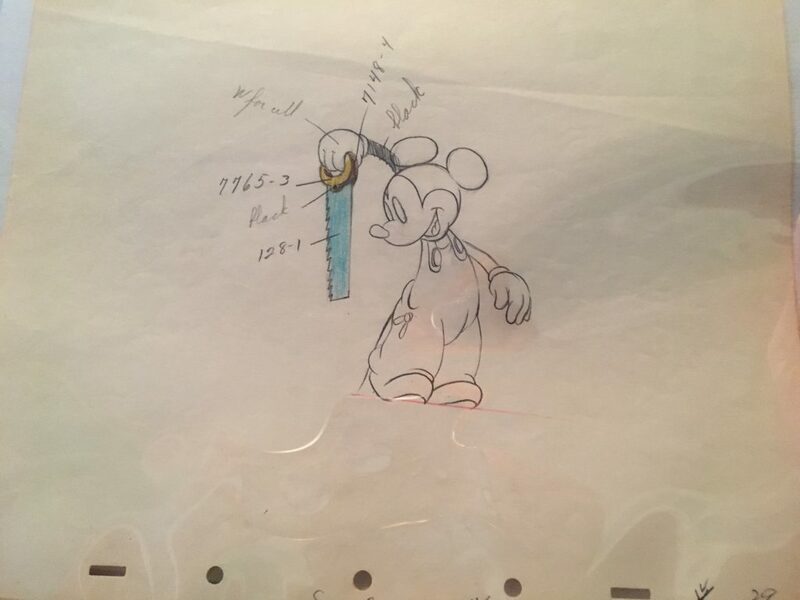 If the restored cel is a Courvoisier set up, or an Art Corner piece from Disneyland, are those aspects of the restored cel being included with the art being purchased? Make sure the Courvoisier background is original and not fabricated. 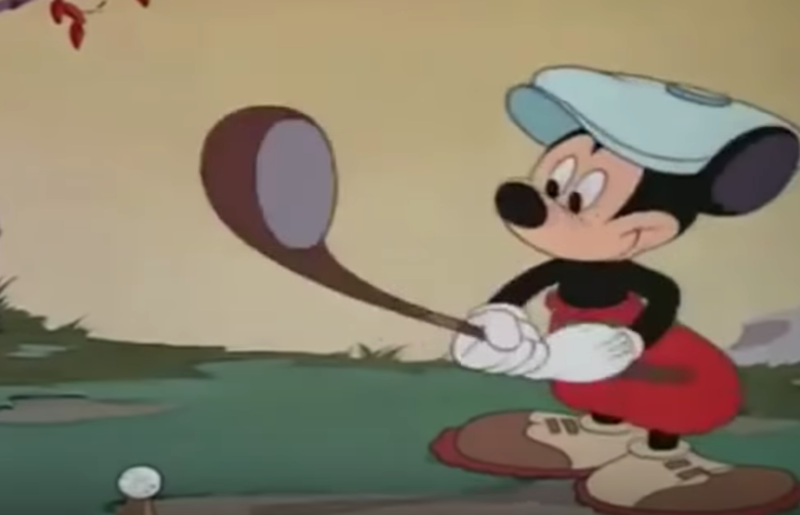 There are some that were being briefly recreated through a new license with Disney. I don’t think it’s being done now, but check the provenance of the art to know for sure. 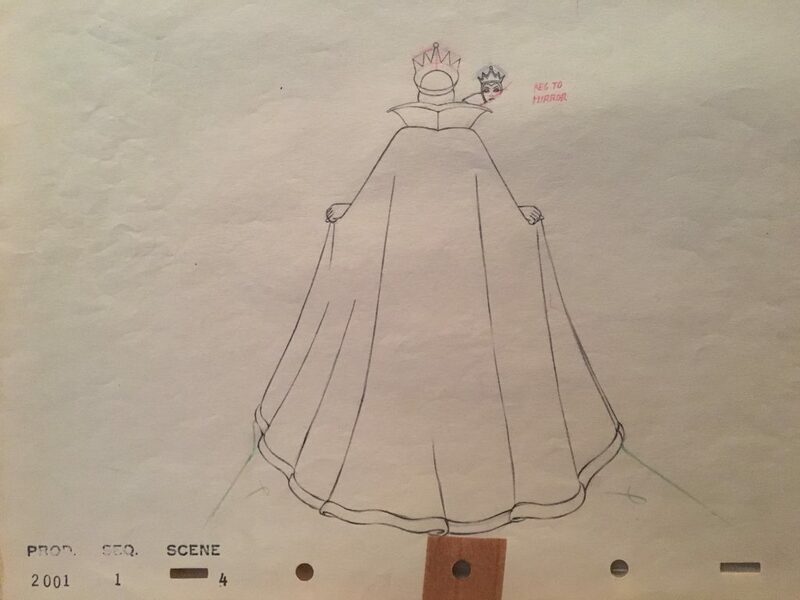 If not Courvoisier or Art Corner, and there is a background, is it hand prepared, preliminary, or studio background an original background from the film? 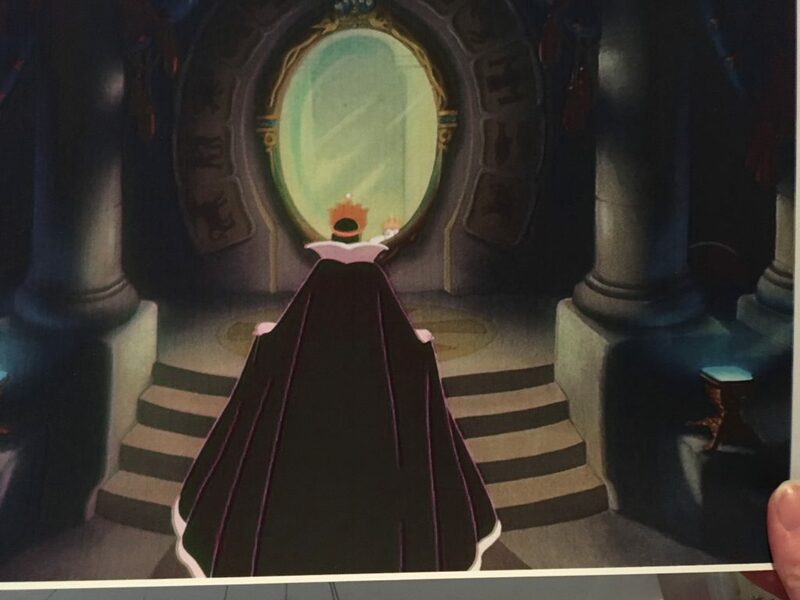 (sometimes someone will call a background a studio background because it is FROM the studio, but NOT from the film. 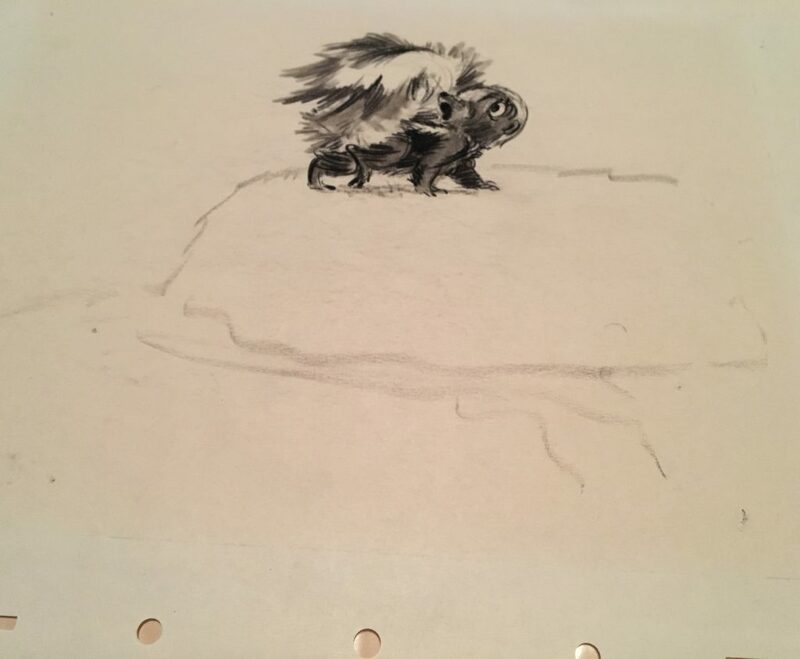 If the art is cracked or there is paint separation, can the provision be that if there is further damage it will be taken care of by the company from which you are purchasing the art? 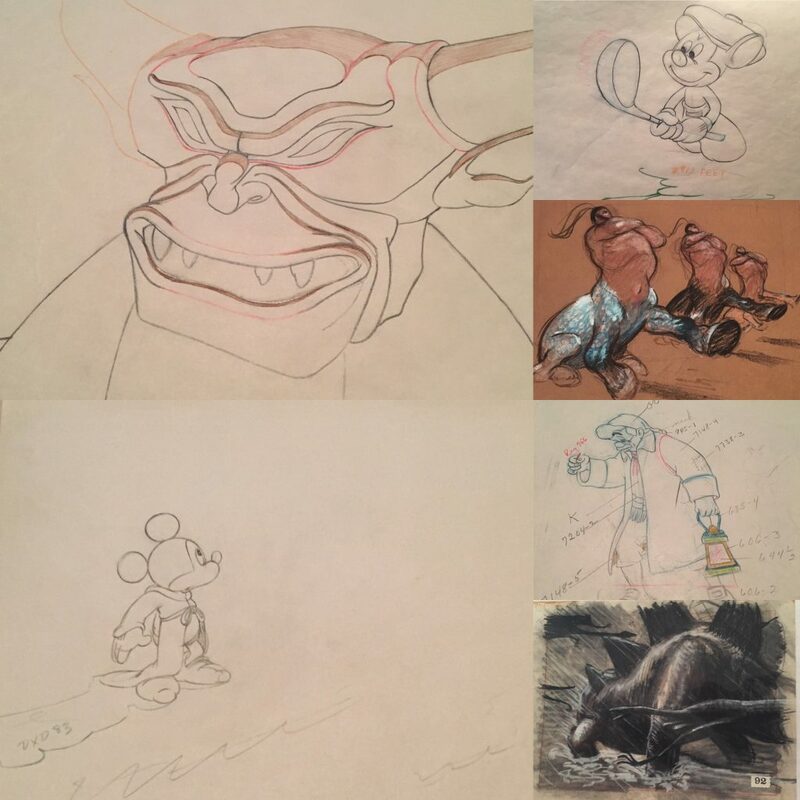 Avoid restored limited editions unless you are buying them for nearly nothing, as well as cels that will be restored that have seeping color in the cel, (like the bright pink of the Cheshire Cat) unless you are willing to have the art trimmed to the outline and reapplied to a new cel. How long will the restoration take? Some studios take a LONG time. Like, years. Ask for a due date, and have it written as part of the exchange. If the restoration takes several months longer than that, consider having it returned. Obviously you’ll want to have an estimate given. Don’t believe there’s only one game in town. By the same token, make sure you have read or heard good references for the restoration studio you are using. I hope this information is elucidating and helpful to those of you who love vintage art, and isn’t too discouraging. To all of us at ArtInsights, we believe you are better off knowing more and being more aware as a collector. If this leans you in the direction of using us to find your art, so much the better. We love creating loyal clients. Even if you never buy from us, at least you’ll go into your own transactions with eyes wide open, and they won’t have been painted that way.